LBB went scouting for the best stylists in the city—for men and women— and here’s what we found. Deepak is a miracle worker when it comes to curly hair! He’ll ensure it falls the way you want- tight curls, straight or somewhere in the middle. They’ll also recommend products for its upkeep. Deepak also does a great job on womens’ hair. Price: Starting at INR 1,770. He works out styling and cuts based on a variety of factors like hair texture, density and scalp conditions; it’s almost bespoke in its execution. Face-cut determines everything, according to him. He’ll cut and style as per the shape of your face and head so that you highlight all your best assets. There is a certain section of men in the city who swear by Parvez and do no trust anyone else with their beloved tresses. He’s equally good with the basic old-school styles as well as something as exciting as a mohawk. The stylists at Toni & Guy do a great job with both men and women’s haircuts. They recommend different styles based on occasions, tell you how to maintain it and even suggest products that can do wonders for your hair. Ask for Deepak or Shahid for a flawless hairstyle. The senior stylists for hair, they’re also the in-house makeup peeps at Martina Wu. While Rita’s great with colour, Martina does a commendable job with haircuts, especially for curly hair. One of the best-known names in the business, when not styling for Hillary Clinton, Sumit runs a jam-packed styling schedule, alongside managing his successful chain of salons. He’s good with every type of hair; he’s superb with edgy cuts and strong post-cut styling. He tends to work at supersonic speed; don’t be alarmed, he knows exactly what he’s doing. You'll need to make a prior appointment though- he's only available on Fridays for a limited slot. Charges: Starting INR 5,000 plus taxes. Try him for a basic top-up haircut, but we don’t recommend trying anything dramatic. He gives a mean voluminous blow dry so if you have fine hair, he’s your guy. 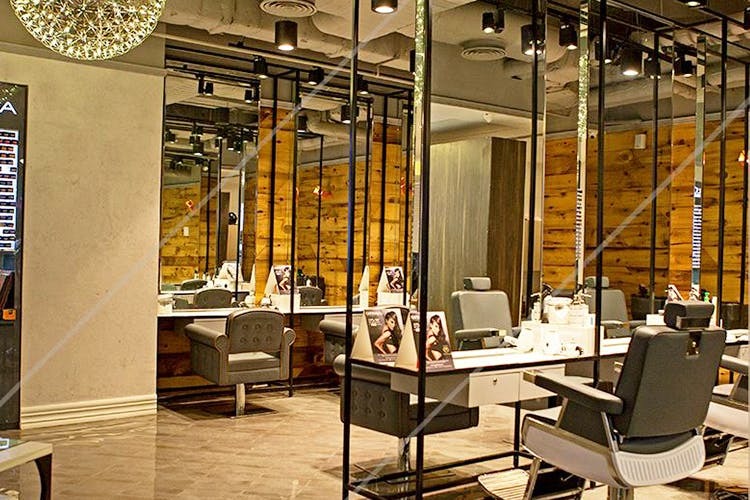 Run by the husband and wife duo, Elvis & Reema’s salon is a great option for anyone who wants to get edgy hair makeovers. While Elvis takes care of haircuts, Reema is the stylist behind the pinterest-y rainbow coloured hair makeovers. Since they have a small team, it’s best to fix a prior appointment.